While there's a couple smaller kicks at the can left, the last weekend of July brings about the end of prime time summer movie season – hope you enjoyed it! At least this one's going out with a bit of a bang – if not in box office, in quality. Mission: Impossible – Fallout marks the sixth installment of the shockingly long running series of the adaptation of the 1960s spy series, which has served now as Tom Cruise's personal playground. Nearly dead after the third outing and Cruise's couch jump on Oprah, it has risen from those ashes and become one of the best action franchises in recent memory, with an ever increasing frequency. It was six years between II and III, five between III and Ghost Protocol, four between it and Rogue Nation, and now three years before this film, meaning that at this pace, by 2022 there'll just be a camera crew following a 60-year old (!) Tom Cruise around at all times as he films death defying stunts. Fallout sees Christopher McQuarrie return to the director's chair (the first person to do more than one) for another globe-hopping series of exploits about ... some terrorism plot or another – does it really matter? When it inevitably goes wrong, Cruise and his team (a bit of a greatest hits returning version, with Simon Pegg, Ving Rhames, Alec Baldwin, Rebecca Ferguson, Michelle Monaghan) have to go on the run to clear their names and save the world, all while being chased by CIA super-assassin Henry Cavill (he of the bicep-powered beard) under the auspices of director Angela Bassett. 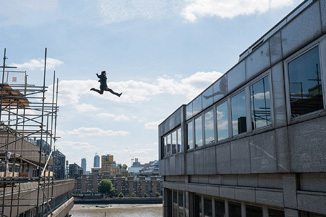 From here, it's the typical Mission: Impossible sequences of fights, chases and real, live-action stunts that look like they might actually kill Tom Cruise. This time around it's a helicopter spiral and a jump from building to building that actually broke his leg and halted production for some time (but remains in the film!). In some ways it's the same old same old, but in others it's a remarkable execution of a simple idea – exciting, practical stunts in exotic settings. Reviews have never been better for the series and an all-out promotion blitz has positioned this film strongly in the later summer. In its latest incarnation, it's never been a opening weekend powerhouse, in one case even pulling a national release slate stunt over Christmas (which mostly worked). There's been a steady climb up in raw numbers and the boost from reviews should be good for a solid improvement to around $60 million. It's an article of fact that outside of Wonder Woman, the only thing that's really been working well for DC's movie division has been its animated films, while the main DCEU has been a garbage fire tornado. Pulling in one of its more popular animated titles from TV into its film debut, WB and DC will try their hand at making Teen Titans Go! To the Movies a bright spot in their eternal darkness.